One of my all time favourite headphones was the Samson SR840 (review) which we reviewed here was basically a Superlux 681 in disguise. That headphone offered a superb sound quality to price ratio and gave wonderfully detailed sound with a large soundstage at around £35. Additionally, we also had great performance out of the Superlux HD660, the companies closed back studio monitor. In the past few years, though, as other companies moved forward with their aesthetic design, the Superlux offerings were beginning to feel a bit outdated. 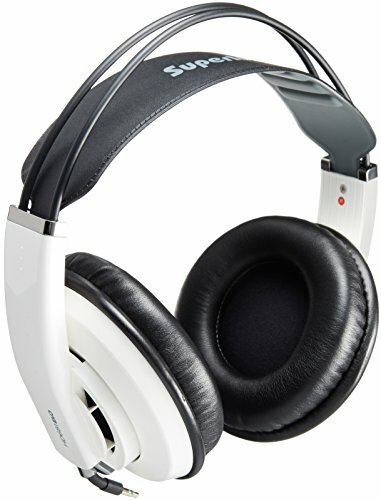 Step forward the Superlux HD681 EVO review… the evolution of the original 681 which offers a stylish new design. We take a listen and see if that new design still offers the excellent sound quality of its predecessor. The box itself is nicely styled with a good amount of information about the headphones on the outside which is also complimented by some new bold graphics. Inside, the headphones are suspended and protected by more cardboard and whilst not being overly impressive one must remember that these headphones offer a lot of value for money. So as long as the money saved on the packaging goes into the cans themselves then we have no problem at all. Heres where Superlux differentiates themselves from the rest of the pack. The standard fare of jack adapters and a carry case that is not much more than a velvet pouch emblazoned with the Superlux logo is all there but their other goodies packed inside the box. First up Superlux offers 2 detachable cables of varying length, we mention this because at this price it's very uncommon for a headphone to offer detachable cables. This allows for years of use and if you are particularly rough on your cables you simply swap them out. This is all nice but what we were mightily impressed was with the inclusion of 2 sets of earpads. The pads which come attached are of the pleather variety and nothing really to write home about although it is nice to have a spare set lying around. The other set which comes in the box is a lovely set of velour pads which feel great and offer great padding. It was a bit fiddly to get them on but when we did comfort levels were vastly improved. It would have been nice to see a hard case but given the price and the fact that they are intended for home use due to them being open backed it would be very hash to criticise the decision to leave a case out. One criticism of the headphones is the plastic build quality. It not the same sturdy plastic the company used of the HD660 which themselves were, by all means, a budget set of tanks. The Evo, unfortunately, has that cheap kind of plastic feel and as such feel a slightly fragile and brittle. As long as you take care of them you should not have any problems but it is certainly something to consider for those who have the tendency to be a bit rough with their gear. With the velour pad installed these are an extremely comfy set of cans with just the right amount of clamping pressure. A vented back and a very low weight mean there is absolutely no issue to wear them for an extended amount of time. The headband is elasticated and self-adjustable so you don't have to fiddle about changing the arm length making then a pop on and play headphone. Finally, they are fully circumaural giving both good distances to the driver and amble space for the ear to breath freely. Overall the sound is slightly warm, clean and clear and with a heightened bass presence. Soundstage is also quite large which is a traditional effect of open backed cans and goes well with stadium and live acts respectively. Highs – The previous generation of the headphones did have one common complaint which kept popping up and that was their tendency to get a little peaky at times in the upper regions. We are happy to report that this seems to have been ironed out in the EVO. The highs are very clear and clean with the little roll off and do not suffer from the past sibilance issues at all. Mids – The mids yet again are produced very clearly providing a pleasant reproduction on vocals. Detail retrieval whilst not excellent is certainly good enough that it is better than the standard fare. For the most part, stringed instruments came across well sounding accurate. However, when things start to get a bit faster, such as in the metal genre, with its super quick guitar riffs, the EVO does do with just a touch more driver speed. Lows – We thoroughly enjoyed the low performance. It offers copious amounts of sub-bass when required and despite that it still didn’t seem to bleed over into the other frequencies which are a rather uncommon trait at this price. Usually, headphones under £50 will suffer from a mess of bass smothering the mids but here the clarity remained good in the mid bass whilst still providing an adequate punch to get your head bouncing. If there is one criticism I would say that decay time is rather long on some tracks and again we put this down to the driver speed as mentioned with the mids. What more can we say, at $45 this level of sound is just ridiculous.